Description: Cat Mario 4 features a protagonist with a facial likeness to a cat except he or she walks upright like a human. This game is based on the world famous Super Mario game. You are a white cat and you try to go as far as you can but there are enemies trying to stop you. There are a total of four levels and each contains various traps such as falling brick walls, bouncing monsters, death spikes, power blocks with poison mushrooms or hidden blocks that when hit will trap the player’s progression in the level. You will need to have really big patience if you want to win this game. You don’t need to collect any coins because you will never get an extra life. Just keep calm and see all of the possible dangers that are coming and later evade them when you start playing from beginning or from the blue flag. Blue check point flags, if touched, will save the level restart point as that part if Cat Mario happens to die. Cat Mario’s main method of attacking is a scratching attack that works in close corners. This can be dangerous against enemies that can strike from a distance. 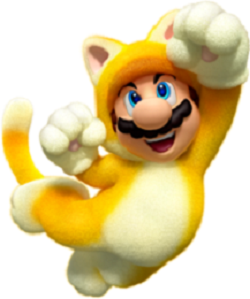 Though Cat Mario 4 can climb up walls, this leaves him wide open to other enemy attacks as he cannot fight while stuck to the wall. It has been dubbed a “rage” game due to the very easy accumulation in number of deaths the player can obtain from the constant and unfair traps that kill the protagonist, and the frustration behind how difficult it is to pass an area without repeatedly dying. Despite the surprise factor of these traps, the levels do not change between plays, allowing the player to memorize their locations and eventually make progress. Experienced players must still remain on guard, though, lest they let years of platforming convention overrule their knowledge of the traps and trick them into deadly accidents.